I've been neglecting this blog I know. You see, I am not really a great blogger. I'm not much of a writer but I do enjoy sharing my outfit to people. Hence this personal style blog of mine. I envy some people who get to write a lot about their outfits and the inspirations behind the said outfit. If you ask me what inspired me about my outfit most of the time I would draw a blank. 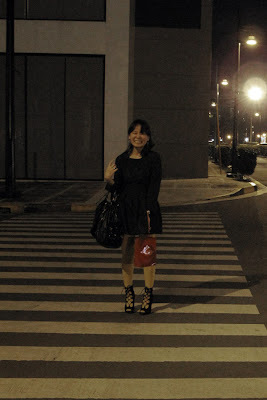 But anyway let me share what I wore last Friday night (Christmas dinner with friends). This dress reminds me of Jenny Humphrey’s dress during the wake of Bart Bass. I would have worn black tights but that would be too much black for a Christmas dinner don’t you think? hI! lOVE YOUR BLACK LACE-UPS!!! MAY I ASK WHERE YOU GOT THEM? the shoes totally make it. LOVE! im crazy about your shoes ! i would like to know where you got them too ?